Obama’s Economy Versus Trump’s Economy: Which Is Tops? Supporters of President Obama argue that President Trump has benefited from the economic policies from his predecessor, rather than from his own policies. How does the economic performance compare between the last 24 months of the Obama Administration, and the first 24 months of the Trump Administration across important economic metrics? Overall Economy. For the first two years of the Trump Administration, gross domestic product (GDP) expanded by 9.9%. This compares to 6.4% GDP growth for the last two years of the Obama Presidency. In terms of inflation adjusted (real) GDP growth, Obama’s GDP growth was 4.8% versus Trump’s advance of 7.5%. Advantage Trump. Jobs. For the first two years of the Trump Administration, total non-farm jobs expanded by 3.3%. This compares to 3.6% non-farm job growth for the last two years of the Obama Presidency. In terms of manufacturing job growth, Obama’s growth was 0.5% versus Trump’s advance of 3.7%. Advantage Obama Overall Job Growth; Trump Advantage Manufacturing Job Growth. Unemployment. For the first two years of the Trump Administration, the unemployment rate declined by eight-tenths of one percentage point. This compares to a fall of nine-tenths of one percentage point for the Obama Presidency. Advantage Obama. Wages and Salaries. For the first two years of the Trump Administration, non-farm wages and salaries rose by 9.4%. This compares to a lower gain of 8.2% for the last two years of the Obama Presidency. Advantage Trump. Federal Spending and Taxes. For the first two years of the Trump Administration, federal spending as a percent of GDP fell by approximately one-half of one percentage point. This compares to an increase of approximately one-half of one percentage point for the final two years of the Obama. For the last two years of the Obama Administration, federal taxes as a percent of GDP expanded by 0.225% while they declined by 1.22% for the first two years of the Trump Presidency. Advantage Trump. Federal Deficit and Debt. For the first two years of the Trump Administration, the federal deficit as a per-cent of GDP fell by 68 basis points or 68 hundredths of one percentage point. This compares to a decline of 36 basis points for the final two years of the Obama. For the last two years of the Obama Administration, the total federal debt as a percent of GDP expanded by 424 basis points, while they declined by 110 basis points for the first two years of the Trump Presidency. Advantage Trump. The president’s influence on the overall economy is limited with other factors such as global growth and Federal Reserve policy playing significant roles. Nonetheless, there is evidence that Trump’s economic policies of less regulation and lower taxes since taking office are pushing most economic metrics in a more favorable direction than experienced in the 2.0 years before Trump assuming the presidency. Almost all of the major Democrat candidates for the party's presidential nomination support expanding Medicare to cover all U.S. residents. Medicare is already the second largest program in the federal budget. The Congressional Budget Office (CBO) projects it costs $583 billion in FY 2018, representing 14 percent of total federal spending. Adding to this burden, the Mercatus Center at George Mason University estimated that this "Medicare for All" would cost taxpayers approximately $3.3 trillion per year, or 75% of total federal spending of $4.4 trillion in 2019. Even without this program expansion, excessive federal spending has ballooned this year's October to January federal deficit by 77% over the deficit for the same period last year. Central to the soaring deficit problem is the growth in programs such as food stamps (SNAP), Medicare, and Medicaid. The Congressional Budget Office has estimated these three programs will skyrocket by two and one-half times the expansion in the overall U.S. economy to almost $1.4 trillion in 2020. And this is without expanding Medicare coverage to younger Americans. Interest on the accumulated debt for these three programs alone will amount to almost $50 billion in 2020. Interest payment on the U.S. debt was $843 billion in 2018, or approximately $5,600, for each worker in the nation. As bad as the Medicare expansion policy is on the debt and deficit, the proposed method of paying for it is even worse. New York Congressional Rep (D) Alexandria Ocasio-Cortez has proposed that spending growth on social programs can be paid for by printing more money and/or raising income taxes. Of course, there really are only three ways to pay for the Medicare expansion: 1) Printing more money and spurring excessive or hyper-inflation, 2) Issuing more debt and ballooning interest rates, and 3) Raising the tax burden on workers. All three outcomes would slow investment and economic growth. The oddity of Medicare for All is that the biggest supporters are young citizens, the same individuals that will have to pay for the rocketing debt burden with either excessive inflation, higher interest rates, higher taxes, or a combination of all three. Democrats, including presidential candidates Senators Warren, Harris, and Booker, have endorsed the Green New Deal (GND), a federal spending program to address income inequality, and climate change with an estimated cost between $2 trillion and $5.7 trillion. New York Democrat Representative Alexandria Ocasio-Cortez (AOC) seeks to include basic income programs, and universal health care programs into GND, thus pushing the cost of the program to the higher limits.  the top 50% of income earners paid 97.3% of income taxes with the bottom half of income earners paying only 2.7% of income tax collections.  Furthermore, the top 1% of income earners paid an individual income tax rate of 27.1%, which was more than seven times higher than that of the bottom 50% of earners that had an average individual income tax rate of 3.5%. Thus, a tax to support the GND that differentially supports low, and middle-income taxpayers would further distort a tax system that already punishes educational achievement, innovation, and entrepreneurship which lead to income growth. The GND list includes goals like “eliminating greenhouse gas emissions from the manufacturing, agricultural and other industries” and “meeting 100% of national power demand through renewable sources by 2030.” Contrary to its advocates’ rhetoric, an increase in income tax rates on high incomes will increase, not reduce income inequality. In 1980, the top 10% of income earners paid 49.3% of total individual income tax collections, while the bottom 50% paid 7.1% of collections. More than three decades later, the share of income taxes paid by the top 10% soared to 70.9%, as the bottom half’s share sank to 2.8%. What happened to income inequality during that time span? As measured by the Gini coefficient, income inequality climbed by 12%. Thus, empirical economic data indicate that the proposed GND will increase taxes, discourage educational attainment, and increase income inequality. Politicians and pundits have battered Americans with claims and counter-claims regarding the impact of immigration on American wages. Wage data from the U.S. Census Bureau and Bureau of Labor Statistics for 381 metropolitan areas between 2013 and 2017 show a clear positive relationship between legal immigration and wage growth. 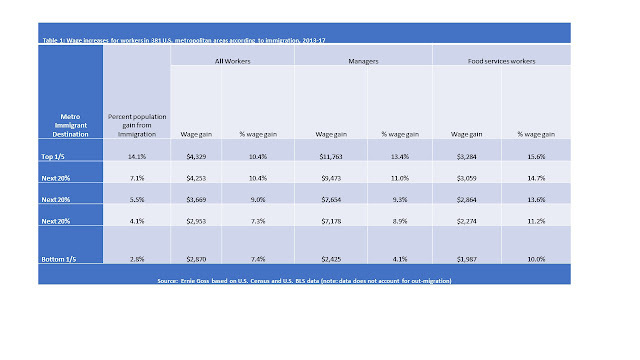 In terms of the percentage of legal international migration, the top one-fifth of metros in terms of immigration gains experienced wage increases of 10.4% ($4,329) for all workers, 13.4% ($11,763) for management, and 15.6% ($3,284) for food service workers. The one-fifth of metros experiencing the lowest immigration gains experienced wage gains of 7.4% ($2,870) for all workers, 4.1% ($2,425) for managers, and 10.0% ($1,987) for food service workers. Legal immigration was supportive of higher wage growth between 2013 and 2017 (see Data in Table 1). Statistically speaking, correlation coefficients show a positive relationship between percent of population growth from immigration and wage expansion for all occupational categories examined. Contrary to expectations, the strongest positive relationship between immigration and wages was for low wage occupations. Unfortunately, today's debates regarding illegal immigration on the U.S./Mexico border undermine legal immigration and economic growth, other factors unchanged. French President Macron last week scrapped his carbon fuel tax, which was designed to reduce carbon emissions and slow climate change. One million French environmentalists and others rioted against the tax. In environmentally friendly Washington State, voters twice rejected a carbon tax suggesting that even environmentalists want a less transparent solution to climate change: specifically, one that hides the costs and taxes someone else. French and Americans prefer energy taxes to be hidden by subsidies, and managed by government enterprises. The latest U.S. Department of Energy data from 2016 show that electricity producers in the U.S. received $15 billion in subsidies with approximately $6.7 billion going to renewable energy. Thus, despite accounting for only 17% of electricity production, renewable electricity producers received almost 45% of subsidies. Even with the subsidies, renewable electricity costs per megawatt hour (MWH) of production, including plant and equipment costs, greatly exceeds that of more conventional methods of generation. For example, relative to nuclear electricity production, costs per MWH for wind was five times that of nuclear, and solar was six times that of nuclear. But instead of producing more electricity with carbon free and cheaper nuclear, the U.S. has embarked on closing nuclear facilities, and expanding wind and solar. The higher cost of electricity due, in part, to the contraction of cheaper conventional and opening of more expensive renewable has been differentially borne by low income Americans. In 2016, U.S. income earners in the lowest 20% paid 34.2% of their income for utilities and fuel, while the top 20% of U.S. income earners spent only 2.8% of their income on utilities and fuel. Similarly, between 2013 and 2016, the share of income spent on utilities declined for high income Americans, but expanded rapidly for the lowest 20%. In terms of efficiency and transparency, federal, state and local governments should implement a carbon tax that allows consumers and business, not government, to decide how to allocate scarce resources. Rebates could then be issued to families with lower incomes that are disproportionately harmed by the carbon tax. French President Macron was finally on the right side of an issue, but the French public, like the American public, wish to ignore a market-based, transparent solution. As of October 2018, 31 states and D.C. have legalized marijuana in some form. Alaska, California, Colorado, D.C., Maine, Massachusetts, Nevada, Oregon, Vermont, and Washington have adopted the most liberal laws for recreational use of marijuana. To gauge economic impacts, Colorado, the first state to legalize recreational use, represents the best case for analysis. Since 2013, when marijuana was legalized in the state, how has the Colorado economy performed relative to the nation? Jobs and GDP . Between 2013 and 2018, Colorado experienced a 19.7% boost to inflation-adjusted GDP compared to a much lower 12.1% for the rest of the U.S. On a per capita basis, Colorado expanded inflation-adjusted GDP by 10.8% versus a lower 7.5% for the nation. In terms of job gains for the same period of time, Colorado grew its jobs by 14.7% compared to a much lower 10.0% for the U.S. The Size of Government . Per 1,000 in population between 2013 and 2018, Colorado added 6.1 state and local government workers, while all other states kept state and local government as a share of the population flat. Had Colorado expanded state and local government at the same pace as the nation, the state would have had 34,204 fewer government employees in 2018. Crime Rates. Between 2015 and 2016 per 100,000 inhabitants, Colorado reported an increase in violent crimes of 24.2 compared to the nation's 12.5. During this same time period per 100,000 inhabitants, Colorado's robberies climbed by 2.9, while the U.S rate rose by a lower 1.1. Tax Revenue. Colorado's growth in tax revenues from the pot trade rose from $67.6 million, for the year after legalization, to $247.4 million in 2017. This rapid tax revenue growth has motivated other states to legalize or consider the legalization of the recreational use of marijuana. This narrow examination of economic data from Colorado suggests a mixed picture of the economic impact of such an expansion. Retiring Baby Boomers and Rising Interest Rates Explode Federal Debt. There is at least one thing that Democrats and Republicans agree on: higher and higher federal spending. Since President Trump took office in the first quarter of 2017, federal spending has expanded by a compound annual growth rate (CAGR) of 3.9%, while tax collections have advanced by a more modest 0.9% CAGR. As a result, the federal debt exploded by a CAGR of 4.6% to an estimated $21.6 trillion in the third quarter of 2018, representing 104.8% of the nation's annual output, and the highest since the last quarter of the Obama Administration. Both Democrats and Republicans signed on to this spending growth with Democrats resisting tax cuts, but embracing spending increases. The federal debt will only get worse. With more than 10,000 boomers retiring each day, social security payments are soaring at a CAGR of 4.6%, and Medicare benefits are exploding at a CAGR of 5.0%. Furthermore, ultra-low interest rates allowed the federal government to borrow needed funds at historically low rates. Since December 2016 to the present, the yield (interest rate) on U.S. Treasury bonds has risen by three-quarters of one percentage point. As a result of rising interest rates and a larger federal debt, interest payments have climbed by a CAGR of 5.0%. Should rates on U.S. Treasury debt rise to the 1990-2007 average, annual federal interest payments would grow by $160 billion to $200 billion, annually.